Girl Meets Dress‘ new vintage dresses collection is almost there! 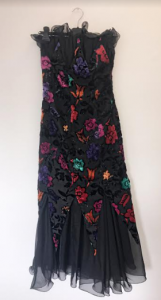 Are you interested in beautiful vintage dresses? That’s perfect because Girl Meets Dress is launching a vintage collection soon. You will be able to buy incredible dresses from different decades, and from designers such as Balmain or Alexander McQueen. A beautiful black with gold vines embroidered long dress. An incredible black dress with sleeves and sequins details. 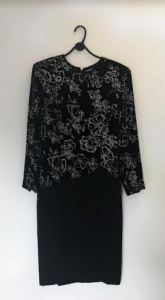 The top is black velvet with black sequins. 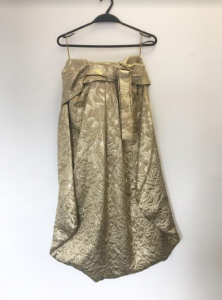 The skirt part is embroidered with gold and detailed at the bottom with sequins. This Balmain vintage black is detailed with beautiful silver sequins on the top. This is a beautiful long black dress. The flowers are made of velvet and are multicoloured. This is a great short black off the shoulders dress rouched. 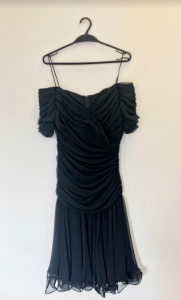 This Max Mara vintage black silk shutter dress is sold with a shawl. 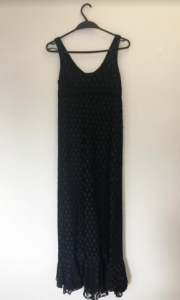 This long lace black polka dots dress. 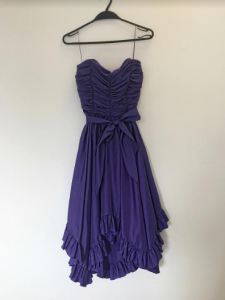 This is a beautiful short purple dress with a bow at the waist and frills at the bottom. 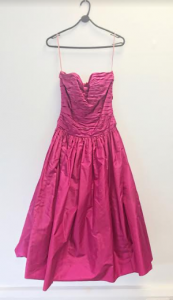 This is a very elegant long magenta dress. One of the sleeve is detailed with delicate frills. This is a long magenta dress with 3/4 sleeves. The dress is detailed with beaded pink and white flowers on the sleeves, at the waist and on the collar. This would be a perfect prom dress. The dress is made of a tulle tutu that makes the dress really puffy. 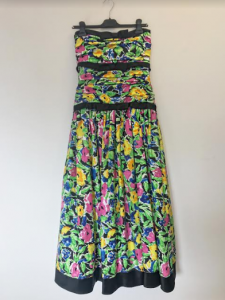 This is a midi flowers strapless dress. It’s detailed with a little bow at the top of the dress. 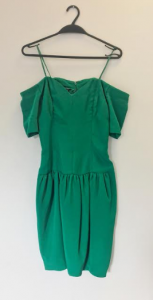 This is a beautiful green dress with straps that delicately fall on your arms. 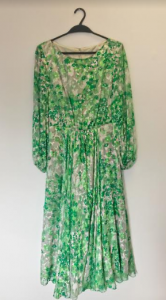 This flowy midi dress is perfect for summer with its green flower pattern. 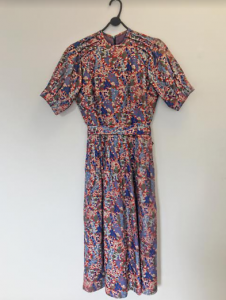 This midi dress is very nice with a Japanese inspired pattern. There is a bow at the waist that keeps the dress structured. 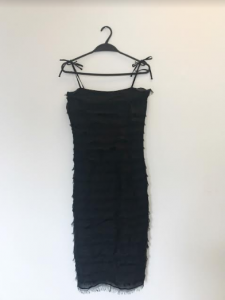 This is an Alexander Mcqueen strapless mini dress. The fabric is detailed with gold flowers. 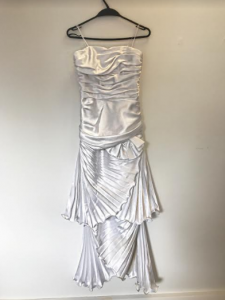 This Jim Hjelm pearl effect midi dress is very pretty with an off the shoulder strap. This midi dress is detailed with daisies all over. 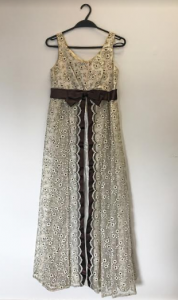 The colour of the dress is ivory and there is brown bow that goes perfectly with the ivory. The first layer of the dress opens at the front, showing the bottom white layer. This is a gorgeous pearly white strapless midi dress. The bottom of the dress looks like beautiful waves. Posted March 16th, 2017 in GMD Daily, Inside GMD, Uncategorized. Tagged: Designer dresses, Dress Hire, Dresses, Evening Dresses, Girl Meets Dress, Hire dresses, long dresses, party dresses, Rent designer dresses, rent dresses, short dresses, vintage, vintage ball gown, vintage cocktail dress, vintage dress, vintage dress for the races, vintage evening dress, vintage gown, vintage long dress, vintage party dress, vintage prom dress, vintage short dress.